Whether it’s a home or business, when a person with an infectious disease has come into contact with an area, immediate cleanup is vital for the health and safety of clients and loved ones. Whether it’s diseases like MRSA, C. Diff, or other bacteria and viruses, microorganisms can live on surfaces for weeks, even months, infecting anyone who comes into contact with them. If you have a pet or person who’s been infected in your home or business, you need to have professionals with strong, industrial-grade cleaners clean every surface that person or animal may have come into contact with. 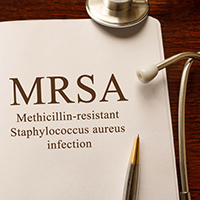 MRSA, or methicillin-resistant Staphylococcus aureus, is a staph infection-type of bacteria that has developed a high resistance to antibiotics and is extremely contagious. It’s usually spread through direct contact or by touching something an infected person has come into contact with. Most often found among those with a compromised immune system such as young children and the elderly, the rate of infection has been growing in the wider population. At Rocky Mountain Biohazard, we offer fast and thorough cleanup for all types of infectious diseases. Whether it’s C. Diff, MRSA, or other bacteria, viruses, parasites, or fungi, we disinfect and sanitize every surface and object in the area with industrial-grade cleaners, making sure to go over every nook and cranny so you can be confident the area is safe for all to use. Don’t Clean Up the Area Yourself! Special training and expert knowledge is necessary to make sure no area is missed when cleaning up after these dangerous and infectious diseases. When an area infected by bacteria and viruses is not properly cleaned, the disease remains a threat for weeks and months to come. Cleaning an area yourself or having your staff do it without proper training makes you liable for anyone who might become sick in the future. To make sure the danger is truly gone, contact our staff for reliable infectious disease cleanup and sanitization. Our staff at Rocky Mountain Biohazard are here to make a difficult time easier. Arriving in an unmarked vehicle, our professional crews are discreet and calm. Along with years of experience and thorough training, we are at the top of the list in knowing how to clean every kind of surface so you have peace of mind your home or business is safe to use. Fully licensed and insured, we strictly adhere to every state and federal mandate, taking pride in our professionalism and attention to detail. With Rocky Mountain Biohazard, you can be assured those you care about are protected. Call Today For Infectious Disease Cleanup! Call Rocky Mountain Biohazard today to discuss your particular situation and to get immediate assistance. All calls are confidential and you will speak directly with the owner 24/7 to determine how we can help you with the infectious disease cleanup.